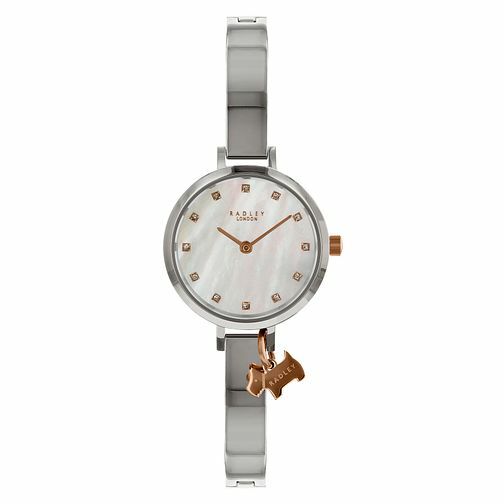 Simply sophisticated styling mixes with sweet design elements and distinctive details with this ladies' watch from iconic London-based accessory brand Radley. This stainless steel semi-bangle watch features a stainless steel casing surrounding an elegant mother of pearl dial accented with stone-set hour markers. Accompanied by a rose gold tone Radley logo charm, this timepiece is the perfect accessory to achieve a classic, casual, chic, everyday style.